I have some very sad news about Borders. It looks as though they are closing their doors forever. 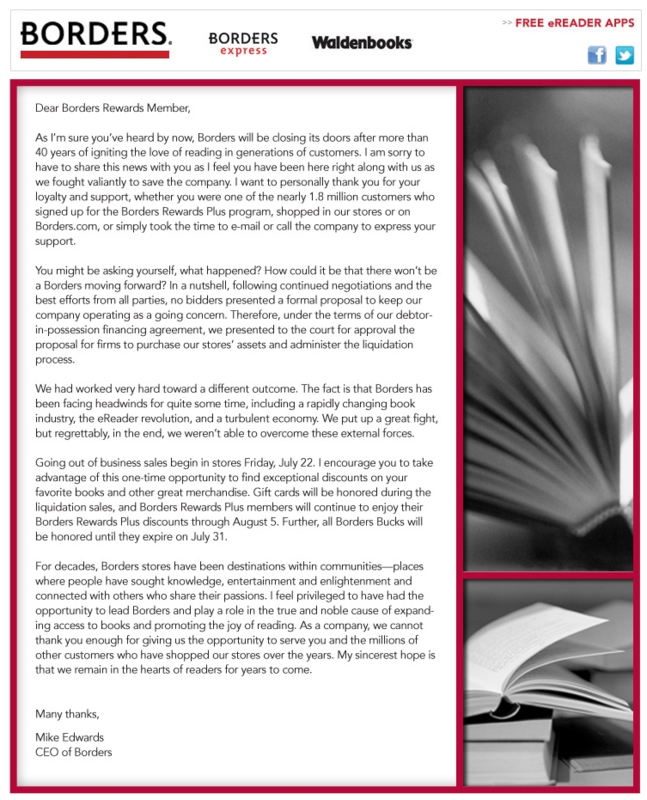 I got an email from them several months ago – Borders Sad Chapter 11 News – which also had a letter in my inbox saying they are closing some stores but not all of them. Well, things didn’t work out too well for them and now they are closing their doors forever. Read the letter that I got from them last night by clicking the smaller image. This is sad news for readers everywhere who have enjoyed visiting Borders over the last 40 years that they have been open. They are closing their doors because they couldn’t convince any company to help them stay afloat. I guess everyone has given up on them. It’s sad though that people have basically abandoned their local book store to buy e-books from the comfort of their home. But this is the casualty of electronic evolution. Although not everyone can afford to buy an e-book reader so there are people who still buy books. Borders doesn’t just sell books though, they sell magazines and toys and cd’s and movies etc. Today is the first day of the sale so if you still have a Borders near you, go there quickly because they close their doors on July 29th. You have exactly 1 week from today. They have a 40% off sale at Borders locations, unfortunately as you can see from the image below that the sale is only in stores and not on their website. It’s sad that they are closing and I hope that there is a chance that they will still keep a few stores open to keep the Borders name alive. Who knows for sure until the end of this month when we find out their final fate.